Polishers come in two main categories: Dual Action Random Orbital and Rotary buffers. If you’re looking for a machine polisher to speed up waxing your car or removing scratches from your paint then I recommend you look the dual action orbital polishers. Unlike rotary polishers, which spin in a single direction forced rotation, dual action orbital polishers, which oscillate or wobble while spinning, are super safe to use. There is little to no risk of burning up or swirling your paint when using a dual action orbital buffer. They also finish out really nice! If you would like to know more about the differences between rotary and dual action random orbital polishers then check out my article Ultimate Beginner’s Guide to Car Buffers. There are a lot of dual action polishers on the market these days, a lot more than many people realize. Fortunately, the are a few clear winners and I’ve listed them out for you below along with what is good and bad about them so it’s easy for you to find the right one for you. 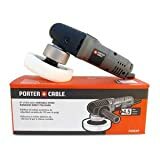 My number 1 recommendation for the best da polisher is the Griot’s Garage 6″ Orbital Polisher, which is first on my list below, because it’s affordable, powerful, reliable, smooth, and super safe to use. The Griot’s Garage 6″ Polisher, or GG6 for short, is one of my favorite automotive paint buffers, especially among the budget da polishers. It takes everything the Porter Cable 7424XP was good at and improves upon it plus it has a lifetime guarantee against defects. It is made in China but was designed in the US by Griot’s Garage and they have a reputation for reliability and no BS warranty claims. 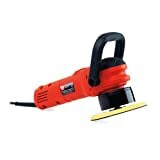 The polisher is one of the cheapest options for a proper dual action random orbital polisher. It comes with a 6″ backing plate and can use as small as a 3″ backing plate to ramp up its aggressiveness and get into really tight spaces for that fine detail work. The motor is one of the most powerful in its class so you don’t have to worry about the pad stalling on you as much as you would the Porter Cable or Chicago Electric 6″ Polisher. However, it’s not too powerful that you risk hurting your paint. It will still stall before any damage is done from too much downward pressure on the machine. I really enjoy the doubleshot rubber grip inserts at the head and tail of the tool. It greatly reduces the vibration felt and fatigue from using it. It’s not as smooth as the bigger (and more expensive) long throw polishers like the The Boss G15 below but it’s smoother than other buffers in the same class. It’s also much quieter than the PC 7424xp and the Harbor Fright Chicago Electric DA. The Porter Cable 7424xp was the polisher machine that started the dual action buffer craze. The first model of this polisher was intended to be used as a dual action sander and wooden furniture polisher. It was then discovered to be pretty great at polishing paint safely. While Porter Cable still doesn’t appear to be interested in tackling the detail market (they haven’t released any new polisher specific tools like other companies) it’s still a great buffing machine for cars. It’s powerful enough that it gets the job done while also posing no risk to your paint. Very beginner detailer friendly. While it’s not as quiet or smooth as the Griot’s Grage GG6, it’s one the most affordable name brand polishers and is sold in most big box hardware stores so it’s easy to pick up and try out. Check out the number of reviews on Amazon. The reviews pretty much speak for themselves. The Harbor Freight Chicago Electric 6″ polisher is definitely the cheapest proper dual action random orbital buffer polisher. If you track down the famous 20% off coupon HF is known for you can snag this thing for under $60. It does only come with a 90 warranty, is quite loud, and vibrates quite a bit. It’s not a refined tool. What it does do, though, is work. It’s function identically to the Porter Cable 7424xp and the Griot’s Garage GG6. You can use all the same backing plates, pads, and polishes. If you’re really not sure if you’re going to like machine polishing the HF da polisher is a cheap way to find out. If you don’t like it you can return it or use it as a sander. If you do you can keep it as a cheap backup when you move up to a nicer auto detail buffer. The MT300 is the evolution of the Meguiar’s G110v2. The G110v2 was almost identical to the above three auto polishers in form and function but introduced a new “cruise control” feature that would speed up the pad if it detected it was slowing down from you pressing too hard. The MT300 maintains this feature and improves upon every other aspect of the tool. The MT300 buffer uses a different body that offers ergonomics similar to that of a rotary polisher with the pistol grip and trigger switch. The only downside to the MT300 at the moment is they seem to be plagued with cord problems. I’ve seen many enthusiasts on the detailing forums complaining of early cord failure. I’ve yet to see this resolved so I’m not yet recommending this polisher over the Griot’s Garage 6″ buffer and the likes. That said, it’s still one of the best orbital buffers. The Chemical Guys Torq 10FX is set up similarly to the MT300 above with the pistol grip body. Like the MT300 it’s an improvement of a previous model (the Torq X). What the Torq 10FX does differently is ditch the pistol trigger for a top mounted power switch and introduce a digital speed display. The function and performance of the tool is similar to that of the Griot’s Garage GG6 and Meguiar’s MT300. The only faults I have with the tool is that it’s made in China and the warranty is only 1 year long. Plus it’s really hard finding the warranty info documented anywhere. I don’t like it when manufacturers and re-sellers make me go treasure hunting for standards specs. Apart from that, it’s definitely among the best car polishing machines. The Rupes LHR12E Duetto is right in the middle of the short throw polishers (GG6, 7424xp, HF) and the long throw polishers (The BOSS G15 and LHR15 MKII) on both throw and price. It’s has a 12mm throw which allows it to polish more at the same speed than the short throw 8mm polishers but not quite as much as the 15mm and larger throw polishers. This also means it’s a little less nimble than the short throw and a little more nimble than the long throw. In summary, it’s a compromise between the two worlds of the short and long throw polishers. It’s a very smooth car buffing machine compared to the cheaper dual action buffers which means it’s more pleasant to use and easier on the body. Rupes is known for their build quality. For many though, the price is hard to justify. 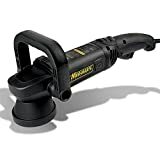 It’s a nicer tool, more efficient auto polisher than the Griot’s Garage GG6 for sure, but I’m not sure it’s enough to command the prices it commonly sells for. That said, it’s definitely one of the best car buffers. The Griot’s Garage The BOSS G15 and G21 polishers are long throw polishers. Their pad orbits around the spindle at 15mm or 21mm (depending on which one you buy, I compare the G15 vs G21 here). This longer throw helps remove material faster when polishing. It also covers more area and requires less pressure. The longer throw also requires a larger more tuned counter balance which means the polisher is smoother. The downside to the long throw is that the machine can’t polish smaller areas as well because the polishing path is wider. The pad also tends to stall (stop spinning) easier on heavily curved and angular surfaces. Basically, this polisher is great for polishing larger vehicles such as large cars, trucks, boats, and even airplanes (especially the 21mm G21). It’s bar none the easiest polisher to use since it’s very smooth and doesn’t require down pressure to polish well. The polisher is even designed as part of a full system of pads and polishes (BOSS stands for Best of Show System). This means you can buy the BOSS pads and polishes with the polisher in a fool proof kit. The only real drawback is price. 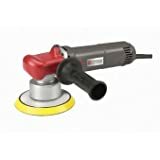 You’ll spend mid to high $300s on this polisher and be in the $400s with accompanying pads and polishes. Everything that can be said for the Griot’s Garage The BOSS buffers above can be said for the Rupes LHR 15 and LHR 21 Mark II polishers. Just like the Griot’s the Rupes MK II polishers are 15mm and 21mm long throw polishers. I compare the LHR15 vs LHR21 here. The differences are the Rupes are designed and build in Italy whereas the Griot’s Garage are designed in the US and built in China. The Rupes also have a shorter warranty of only 1 year and cost a fair bit more. Rupes polishers are also black as aposed to the red color of the Griot’s Garage polishers. That being said Rupes has a solid reputation for refinement and durabilty. It’s a brand trusted by many high end detail shops. It’s also easy to find replacement parts for the polishers, such as bearings and brushes, should you wear them out. Another option in the ring for the best long throw car polisher is the Flex XFE7-15-150. Its features, functions, and form are all similar to that of the Boss and LHR Mark II polishers. This polisher, however, is designed and built in Germany by a long time tool manufacturer. The Flex XFE7-15-150 is lighter than the Rupes LHR MKII but a little heavier than the Griot’s The Boss polishers. It’s also a little cheaper then the Rupes and a little more expensive then the Griot’s. The vibration and noise are about the same as the Griot’s Garage and Rupes polishers. Unlike the Griot’s Garage The Boss and the Rupes LHR MKII the Flex XFE isn’t build around a system of polishes. This is not a good or bad thing. It just means you’ll have to piece together your own combination of pads and polishes (which some may prefer to do anyway). The Flex XC3401 VRG is in between a rotary and traditional free spinning DA polisher. It’s what is known as a forced rotation dual action polisher. The pad moves in an orbit like a DA but does no spin freely. Instead it’s driven by a gear so you cannot stop (stall) the pad. The forced rotation makes it easier to polish curves and angles because it won’t stall. It also makes it a little more dangerous because you can cut through paint on sharp edges that would have stalled free spinning polishers. The polisher also has a tendency to “walk” on you meaning you have to put more effort into guiding it where you want it to go. Before the big long throw DA polishers dropped the XC3401 was the next best thing to the standard throw DA polishers when you wanted to get more aggressive and get more work done. Some still prefer the predictable forced action. It’s still one of the best polish machines for cars but, personally, I enjoy the long throw polishers more when needing to polish quickly or when polishing on large vehicles, watercraft, and aircraft. The Makita PO5000C is a step up from the XC3401 as far as function goes. It can switch between forced rotation like the XC3401VRG or free spinning like the Griot’s Garage 6″ orbital polisher. This is nice because you get the best of both worlds, more control and power from the forced rotation or more safety and better finishing from the free spinning, when you want it. The only drawbacks are the very short throw, meaning you cover less ground in less time, and the price. Other than that, it’s the only one of its kind at the moment. This polisher is kind of a big deal. 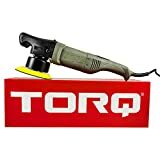 It’s the first long throw orbital polisher that is completely cordless while retaining the same ergonomics of a traditional polisher. The cordless XFE15 also includes two 5 amp lithium ion batteries which can run for a whopping 45 minutes a piece which is more than enough time to correct 2-3 panels if you know what you’re doing. The best part is the cordless aspect doesn’t compromise the polishing power or speed. Unlike the GG5 this buffer still has adjustable speed from 2300 to 3800 rpm (or 4500 to 7600 orbits per minute) and a 15mm long throw. I don’t know about you but cords are something I despise, especially on tools and around cars. They weigh you down, get stuck under the tires as you walk around, flop off your shoulder toward the paint, get tangled, the list goes on. Every chance I get I cut the cord. Unfortunately, this polisher still isn’t appropriate for a full service production detail shop, at least not as the main tool. You’ll still need the corded polishers to keep the work rolling. This might make a great touch up buffer though, for those times when you notice a missed imperfection right before handing the car back over to the customer or when you’re just doing a spot correction. Plus reducing the times you string a cord across the shop will help with maintaining a safe work space. The first of its kind, the Griot’s Garage 5″ cordless car buffer is the first real cordless dual action buffer polisher. Most cordless buffers aren’t true dual action orbital buffers. Rather than spin and orbit they just oscillate or vibrate. These aren’t good for much more than spreading wax. The Griot’s Garage 5″ cordless polisher on the other hand can do just about everything the other dual action polishers can. The only drawback is you only get about 20 minutes to do it. This means it’s a great spot correction polisher or full car finish wax applicator and car wax buffer. The upside to the battery power is that the batteries charge in about the same amount of time as they run out. This means if you bought an extra battery you’d be pretty close to non stop polishing action. The downside is that this polisher isn’t cheap compared to other short throw polishers like Griot’s Garage’s own 6″ (GG6) orbital polisher. 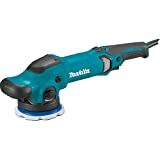 That being said, if you want real dual action orbital cordless car polisher then this is your ticket.